This month I ran my first Kickstarter, with the help of a co-designer, we managed to hit 17,500% of our goal and grabbed nearly 500 backers. I’m as shocked as you are. It’s sort of traditional to do a post-mortem on a Kickstarter, and I figured maybe some people would find it interesting to talk about some of the ideas and concepts that went through my head while designing the campaign. We made some uh, choices, throughout the campaign and the nature of the campaign means some of what we did is obstificated too. Limm is by far and away the core of Orc Stabr’s success on Kickstarter, at least from my point of view. He was essentially created because I didn’t want Sandy Pug Games to be tied too strongly with the Orc Stabr concept – not because I wasn’t happy or proud of the ideas or design, but more because I didn’t want SPG to be seen as a “gimmicky” or be permanently identified as “The Orc Stabr People”, I also figured that the concept of an Orc Designed RPG was funnier if it was delivered entirely straight faced and “In-Universe”. I think the first idea was a mistake, I should have been more upfront about how this was an SPG project and if I was doing this all over again, that’s one thing I’d change. But the second idea was definitely 100% on point. People LOVE Limm. Limm’s success I think stems from a few places – first of all the rule was that he must always be warm and earnest in everything he says. Limm always had to have the best of intentions and always be very very excited. People really enjoyed Limm being so earnest in the video, and we wanted that to extend out to his interactions with the backers, social media and so on. The secret here was, again, in-universe earnestness. The video looks and feels like a video an Orc would make when presenting their game, including putting the price in Gold Pieces and speaking a little “orcish”. Throw in all the little details and jokes and you have a really endearing video that sold the concept to people. We actually had a bunch of other stuff you can’t see in the video – I’d borrowed a friends full suit of really impressive armor to do the vid but we were so close to the camera you can barely see it. It also helps that I have a fair bit of experience doing comedy and filming sketches (though how funny those are is a matter of hot debate), so the basic fundamentals of writing, filming and editing were in my wheelhouse. We also made sure to be very communicative on the Kickstarter page, replying to messages in character and posting updates in character pretty regularly. This, I think, encouraged people to play along and get “in universe” too, which sort of led to this really great self-fulfilling culture that took on a life of its own. People would see the comments and updates and everyone having fun in character and jump on the project wanting to get in on that and be part of the fun. So I’d be lying if I said that the rewards were this cleverly designed marketing gimmick to encourage a sense of community. It kind of was that but not really 100%. One of the other big reasons Orc Stabr became what it was was a conversation I had with a friend about what the smallest most achievable Kickstarter imaginable was. We were both talking about those enormous games that seem to be every game these days – super delayed tomestones with 10000 minis and 4 custom books and magnets and 2 expansions along with t-shirts, posters and other guff before it’s even out of the gate. These things seem perpetually delayed and have a ton of kickstarter exclusives and seem impossible to compete against as a single designer working by themselves. Bare bones, no stretch goals. We ran some basic maths for how much you’d need and figured at $4 per game, $20 would basically make the game doable (because that’s how much ink costs for my printer). We had the basic concept and started coming up with ideas for what fun we could have with a $20 budget, and suddenly the half-sheet idea came to us. At first it was a joke, kind of the polar opposite of those bloated games, our game isn’t even shipping the entire thing, never mind minis and expansions! But the more we talked about it, and especially the idea that people would seek out OTHER owners of game to put together the whole thing, suddenly it seemed like an absolutely fantastic idea. Partly this is inspired by Dark Souls and From Software’s methods of community building by encouraging people to make wikis and the like, partially we thought it was kinda funny. By the time we actually launched the KS, I’d refined the numbers down to about $1.50~ per sheet, including shipping, and figured that we’d get around 20, maybe 30 people backing us. 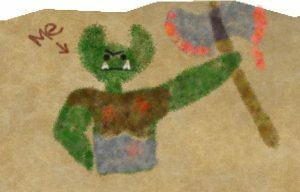 We also changed the name last minute to Orc Stabber, then changed it back to Orc Stabr at the last last minute, which is why that banner image up there says Orc Stabber. We are consummate professionals. It was about day 3 when we realized we’d made an error of judgement and kinda scrambled to figure out what to do with all of this profit we suddenly had coming to us. We decided very early on not to announce any expansion plans as to not undercut the whole joke and concept, and also not to fall into the Kickstarter trap of overpromising and under delivering, but we also decided very early on that the plan was not to just pocket the money. People were buying in on this concept and we figured, hell, lets do something wild with this. We’ll talk more about what we actually did come up with for what to do with all that money, but the important thing I wanted to say here is we figured 100% that we’d end up with maybe $50 each afterwards, based on our estimates, and after the first week it was pretty clear that we had to do something with the concept beyond “Print some pages and mail them out”. That should do it for now, next time I’ll write up some about the actual creative process and some of the other “clever” stuff we did during the campaign that I think helped the project succeed as well as it did. If you wanna chat more about this please feel free to reach out at sandypuggames@gmail dot com.